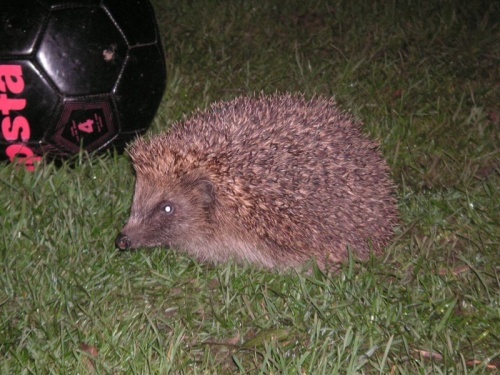 Louis gets let out into the back garden on a regular basis. This is so he can fulfil his side of the quadruped/biped agreement that dictates that he needs to keep the back garden clear of lions. He’s done a good job of this since he chose us. To be honest he took on keeping airplanes out of our airspace as well (we’re on the summer take off flight path from Manchester airport) – he jumps up and barks at them as they pass over the house at a thousand or so feet and then prances around like a tart after they disappear off to some sunny spot. Anyway – to keep us lion-free he has to be let out regularly to do his patrol. Late on a few nights back he was let out and he deviated from his normal (for normal read lawn destroying) route. Needless to say daft hound-boy gave Harry the hedgehog a few investigative snout pushes until he worked out that it wasn’t a good idea.